Many specialty converting applications require the addition of heat to the die to assist in cutting exotic materials (fabric, poly, nonwovens), or to seal material as it cuts for improved edge quality. Heated dies can also be used to seal two or more layers of material. The rotary tool is designed to accept an internal heat cartridge which heats the tool to a preset temperature. Heated tooling finds wide usage in the packaging industry. In-line sealing offers wide versatility for "single pass" production using rotary dies. Heated tooling requires an external heat controller to regulate temperature. 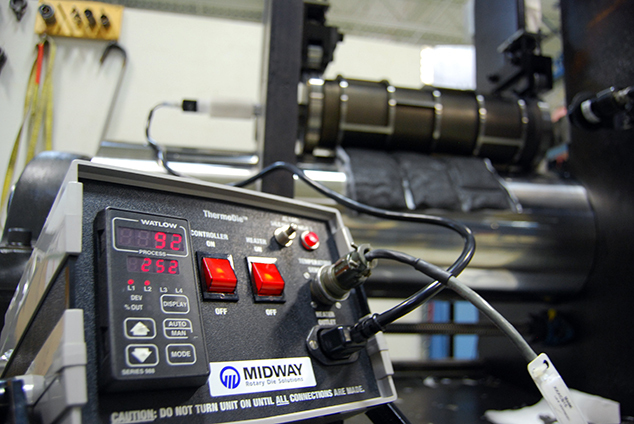 Midway’s tooling can be made to work with your controller, or with Midway’s ThermoDie™ Heat Controller. This controller uses a non-contact, infrared heat sensor to read tool surface temperature for precise control within ± 5°F.